Today on Her Process I have the pleasure of chatting with Sarah Momo Romero. I’m catching Sarah as she’s about to become a published author and illustrator! Her children’s book, Wake Up, Little Bat is due out this fall. And you know I’ll be asking her to come back and share that whole experience with us! Today, Sarah shares how she got her first book published. It’s a process she highly recommends! She also gives us her secret weapon to combat that creative lull. This one may surprise you! And she talks about finding her own illustrative style for drawing people. 1. I love to travel! My favorite trips from the past few years have been to Peru and Japan. I got to explore the beautiful sights, eat delicious food and introduce my family to my husband! As different as those two cultures are from each other, they both represent who I am. 2. I live in east L.A. now, but I grew up in the South Bay, just minutes away from the beach. I miss that beach life. Now that traffic makes going to the ocean an entire day trip, I make sure to plan at least one outing to Sunset Beach to stand up paddle board in the canals, and one to the dog beach in Huntington Beach. I love taking the little Peanut out for adventures too! 3. I'm a sucker for scary movies, even though they can give me nightmares. There's something about the adrenaline rush of the darkness and unknown that always draws me in. The best part about it is the select few friends who will indulge in those movies with me! 4. I was lactose intolerant for a few, very sad years- no cheese, ice-cream or any kind of dairy for me (or at least not without a lactose pill.. so sad.) But as they say, your body changes every few years, and now I can happily name ice-cream from Wanderlust as one of my top desserts again. It's my dairy miracle! 5. I've always loved to read and write, but it's only recently that I've started sharing my stories and writing openly. And on my trip to Japan, my husband and I worked on mini-videos of cute Japanese book stores we visited. I'm definitely not the best on-camera, but I'm working on it. ;) You can check out my writings and mini-videos on my website! Sarah is so open and generous in talking about her creative path…she really makes you feel like you can do this, too. So if you’re ready for some real motivation and tips you can use, listen up! 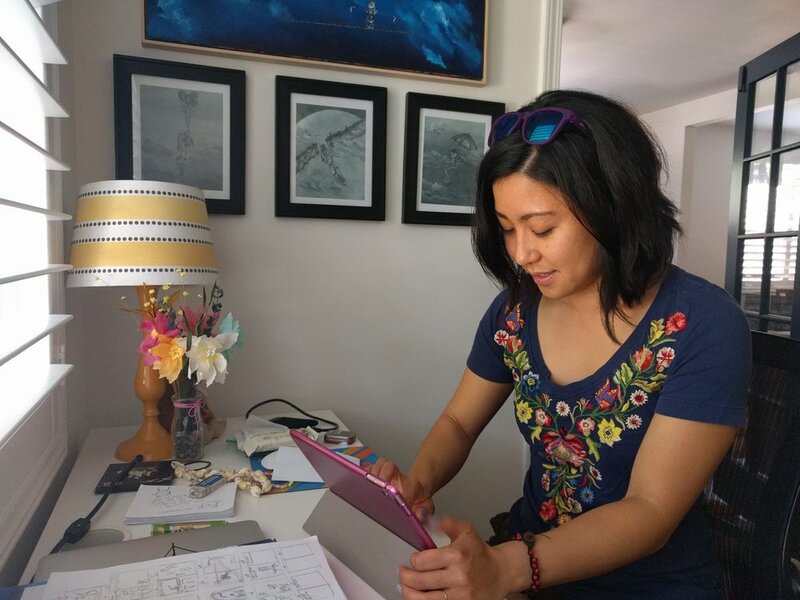 Here is my chat with author/illustrator, Sarah Momo Romero. And now, here’s episode 52.5. Think of it as a ten-ish minute long P.S. to episode 52. It’s a rapid fire q&a where I ask my guests the same twelve questions to hear the similarities and differences among artists of the same and different genres. Some sample questions: Do you check out other artists within your genre on social media? What’s your creative ritual? Do you have a ‘go-to’ person who you bounce ideas off of? Let’s hear what this author/illustrator has to say!